Barry Mitchell was born in Belfast in 1958. He studied music at Queen’s University Belfast where after completing a first degree he studied for an MA in composition. He is also a graduate of The Open University. He has taught music for several colleges and universities in the UK including The Open University and Rose Bruford College of Theatre & Performance. He has worked as a music examiner for Edexcel Foundation and International Baccalaureate Organisation and has been a reviewer for The Times Higher Education Supplement. He is currently a freelance teacher and lives in Twickenham in Greater London. 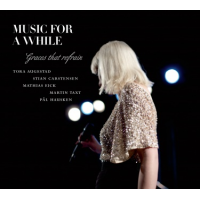 Album cover, Graces that Refrain by Music for a While, Grappa Records 2012. Music for a while is a Norwegian jazz quintet headed by cabaret diva Tora Augestad. Their album Graces that Refrain (Grappa Records, 2012) delivers chamber music/jazz transformations of classical songs. The translation in Schubert’s Wanderers of Der Leiermann from Schubert’s song cycle Die Winterreise is featured in the CD booklet. Schubert’s Wanderers is available on Amazon.co.uk and on most Amazon sites worldwide. PART I SCHUBERT’S DIE WINTERREISE: ENGLISH TRANSLATION can be read in its entirety below. An English translation of Schubert’s Die Winterreise, settings of poems by Wilhelm Müller and a synopsis of the story told by the poems. The twenty-four poems of Die Winterreise were written in 1821 and 1822. The first twelve poems were published separately in 1823 and the cycle was published in full in 1824. Schubert made his settings of the poems in 1827. These translations are in free verse and are designed to introduce readers to Schubert’s song cycle. I have ignored the original metrical scheme but have tried to make the translations as accurate as possible. I have also tried to use a vocabulary that suggests Romantic poetry. Die Winterreise is primarily about feelings and atmosphere, but there is nevertheless a story, albeit told in a fragmented narrative. A young man, the hero (or anti-hero) of the poems, arrives in an idyllic town in May (Good Night). There he befriends a family of mother, father and daughter and is invited to live with them (Good Night). He falls in love with the daughter and his love is returned, or so he is led to believe (Feeling Numb). However, the daughter rejects him to marry a wealthy suitor with the approval of her parents (The Weathervane). It is now winter and the hero leaves his adopted home in the dead of night after writing a farewell message to his beloved (Good Night). As he leaves the town crows shower him with snow from the roofs (Looking Back) and he begins a painful journey, constantly tortured by memories of his past happiness (Frozen Tears, On the River, The Watercourse). On his journey he is joined by a raven, possibly symbolic of a death wish (The Raven). Eventually he arrives at another town (Solitude) where it seems he stays for some time as he writes of the post arriving there (The Post). The song cycle ends with a particularly bleak image. An organ-grinder or hurdy-gurdy man has a pitch near the town where he plies his trade ignored by the townspeople and harassed by dogs. It is ironic that in this final poem the poet asks if the hurdy-gurdy man will set the poet’s songs to music, an invitation that was ultimately accepted by Schubert. What do they care if my heart is dying? And not noticed them flow? Like drops of early dew? Is the grass still green? Who will speak to me of her? Your image in this river? In its own icy case? Whose garden blooms in winter? Will the leaves ever turn green? Will I ever embrace my sweetheart? Why is the air so tranquil! Why is the world so fair! Heart, where do these feelings come from? So heart, why do you grieve? In the hope I will be yours? But gives me no rest! Why should I linger here? Where the other wanderers tread? Unwelcoming inn, do you deny me shelter? Shall I join you on your journey? Will you play the music to my songs? Thank you for posting things like this in your blog! I sing and often go online to check for translations. (and try to help people myself in my own blog). Caffarelli is a name with a great tradition for a singer! I enjoyed visiting your blog and I see that you visited Liverpool, a city I know well. Yes, St Cecilia is the logo of barrymitchellmusic.com. i Love your post… i am new English teacher, this is very helpfully for me. I love these. May I use them for a student recital, with appropriate crediting? Please contact me at the email address posted if you are willing to give permission, I will be happy to give you more information about the venue. Hi, I have a query, just wondering if you have an email address I can send to? Yes you can contact me at info@barrymitchellmusic.com. I look forward to hearing from you. I am going to use this translation in an essay for a specialization course. Very smart but elegant, thanks! I find myself feeling sorely tempted to do a post of Brigitte Fassbaender’s version of this great song cycle, but I am not yet certain that I have the temerity to pull it off because of the sheer size and scope of it. However, should I manage to do it, I would very much like to use your fine translations of Muller’s poems. If you give your permission I will surely credit you by name as well as post the url to your site. If you refuse I will accept you decision in good grace, as having been made for very good reasons. By all means use my versions of the poems and I am delighted that you are interested in using them in this way. I would look forward to being informed of how you are getting on with this project. Next year I plan to release an e-book which will have the Winterreise poems and the Die Schone Mullerin poems in both English and German versions. I might also include a royalty free licence for performance and quotation. How very kind and generous you are. I have to admit I never expected you to grant my request. I will begin working on this hefty post – my posts tend to run away with me – and if and when I get it done I will be sure to let you know! With my sincere thanks and very best wishes to you. I am still a little overwhelmed…. I look forward to hearing from you – keep in touch. I most assuredly will, and Thanks once more. I am scoping out images now! This will be a gargantuan post – I might have to break it into two parts. I just completed part 1 of my post. Would you please be so kind as to let me know if you think I should add, subtract or modify anything? Part 2 will have much the same format…. Thank you again, and Kindest Regards. That looks great – I love the illustrations, an excellent post, I hope you get loads of viewers. Barry – you are such a generous man. Thank you. Part two is also done. It took me 20 straight hours to put everything together – searching for pictures mostly. I decided to leave out the German lyrics – the post would have been too bulky otherwise. Thank you for your kind words – and for making my posts possible. The whole thing would have been utterly impossible without you. And Complements of the Season to you as well. I will credit you in the title of the post for your translations, right along with Schubert, Müller and Fassbaender! I think this project will be too unwieldy for a single post, so I am considering doing it in two parts. Would I be imposing on your generosity too much if I were to use your text and tags as well? Well, actually I am asking you now! Once again, I will credit you in the title for text and translation, and at the bottom of the post I will mention the tags, and include an url for your blog. And once again, I will be in full accord with you if you were to refuse to grant yet another enormous favour. Barry- I like you translation. I`m German and just studied both, the German version and your English one, because we are working on this masterpiece in our evening classes. By accident I found your blog and I like reading it. Maybe the translation can be considered to work with…. I’m glad you like my version of the poems – I say version rather than translation because this is a free re-writing and interpretation of the original rather than a translation. I wish you all the best with your study of Schubert. I have more Schubert posts planned in the near future. Lovely version. Why do you call it blank verse, though? That means unrhymed iambic pentameters — like much of Shakespeare’s theatrical work. Yes that is a good point I should call it “free verse”. I would change it but I have a problem with this post because for some reason if I try to edit it the formatting goes crazy, so I will leave your comment as a comment. Thanks for the positive comment on Theory of Music! The 5th line, “Das Mädchen sprach von Liebe.” sprach = speak, and liebe = love. So the normal translation would seem to be “The maiden spoke of love.” So, how do you figure it translates as “the maiden had a friendly smile”? Interpretation is one thing, but this seems to a complete rewriting of the text. Why would you do this? This version of the poems is a rewriting of the translations by Theodore Baker and the line you mention is actually unchanged from Baker’s original. I imagine Baker did it this way because it fitted well with the music but as you say, it is quite different from the original. I found your brilliant article via a young blogger’s most recent exercise http://throwcase.com/2014/08/25/my-pink-schubert-canary/ and I can’t thank you both enough! Schubert has been a constant companion since I first discovered him as a school girl in the 50’s and the Winterreise is my greatest love. I’ve been lucky enough to perform it with many of my generation’s greatest pianists, Graham Johnson and Imogen Cooper among them, and later this year I’ll be conducting a Winterreise Masterclass as part of the Oxford Lieder Festival’s monumental Schubert Project. I would very much like to use your ‘free verse’ interpretation as a basis for the audience and indeed for the young participants, many of whom I expect will already be familiar with it – it is just perfect! Appropriate accreditation of course. PS I have my Kindle version now but could not immediately see an opportunity to purchase a hard copy or a Word version which I would prefer – are either of these option available? Thank you for your comments which I am very pleased to see. I would be delighted for you to use my versions of the Winterreise poems in your notes etc for the concert. Please send an email to barrymitchell9@gmail.com and I will send you a Word document of the book Schubert’s Wanderers at no charge. It would be great to have accreditation for this so if you send me details of the event I will publicise it on my website. I’m glad you think my versions are suitable for younger audiences as they were more or less written with that kind of audience in mind. Most of the people who visit my website are high school students from the USA so I try to address that demographic if possible. I look forward to hearing from you and thanks again for your feedback. Many thanks for your reply Barry and apologies for delay in responding – have been away having a few days off! Will email you everything you mention over the weekend. Wonderful job ! Thanks for the English Translation..
I’m posting this to let you know that people are still reading your fine translation of Die Winterreise, and are grateful for it. I’m neither a teacher nor a performer of music (although I was the latter in my youth), just a lover of music with only a rudimentary knowledge of German (better in my youth). Danke! Thanks for your comment which I am sure readers will find useful. Thank you! This is another way to think of the wonderful poetry and music written for it. Reblogged this on Art therapy-When the impossible happens. nice poem, I like poems, my father is also a writer so i am a berth listener. Thank you for this, am a lover of Schubert and this means so much to me,God bless you, also you can visit my site to check out my own music theory reviews, thank you soooo much for this, and continue sharing the love!! !